Amy from Amy Blogs Chow is a little firecracker. For some reason, I thought she was more of a quieter type. I don’t know how I came up with this idea seeing as the background music to her videos is often something uppity like “Mmmmbop.” She’s late to our appointment, but it doesn’t matter to me, I’m in Starbucks typing away. (by the way, the Starbucks in Flushing is probably the most computer-friendly Starbucks out there). To say that this place was made a bit more famous by Anthony Bourdain’s visit is an understatement. Over the course of our lunch, there were three other groups of people taking pictures of the food here and none of them were of the Flushing demographic. Of course, I am looking to be absolutely blown away by the food here. Nothing short of that will suffice to live up to my expectations, so it’s going to be tough to live up to that. While that was not the case for the meal in it’s in entirety, it was the case for the noodles. 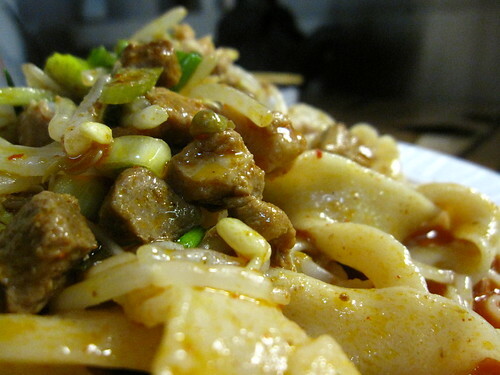 The noodles are handmade with wheat flour. They are pressed and pulled by hand. No rolling pins, no pasta makers; the entire process is done by hand (in this case, the hands of expert noodle-stress Maria – what a doll she was). The noodles are enough to make the trip out here, but you don’t have to, because there’s one in Chinatown now (link) . Let’s deconstruct. We got some Drinks (pic) from the fridge. Mine was a sugar cane in water and Amy’s was a lemon soda. She said it was a powdered soda, I agreed it tasted a bit Tangy (I would say, ‘no pun intended,’ but the capitalization makes it a different word all together). I liked Amy’s more, regardless. Our first course was the Lamb Burger (left). It was delicious. It didn’t taste like Chinese food at all. Jason (member of the family and impresario) came to visit us during our meal, and I asked him if the food had any Uighur (wiki) influence and he admitted it did. I went to a place similar to this in China when I taught English there, and that’s what it reminded me of. 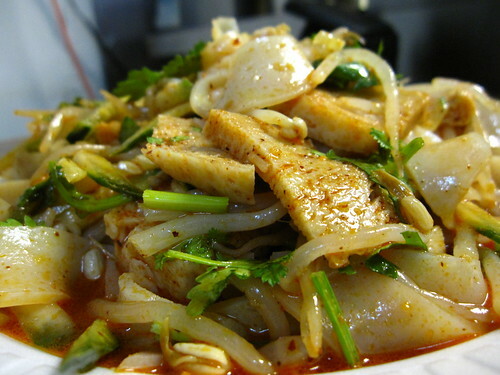 The next item we had was the Cold Noodles (top) – this is their most popular dish. There were about twenty to-go boxes stacked up at the counter leaving in quick succession as take-out customers breezed by – I figured that this must have been what was in the containers. Zachary Cohen asked me if it was as Spicy as Szechuan Gourmet (link) and I had to say that it wasn’t, but it was hella spicy. I don’t believe that heat makes the food, so I don’t know why I just wrote that, but I’m leaving it in. We also had the Pork Noodles (pic) which was a hot (temperature-wise) version of the cold noodles with pork instead of tofu. I liked this the best, but it was damn near impossible to eat with chopsticks, and don’t even think about asking for a fork and knife. I slurped this one down with gusto as Amy took many photographs of me that I forbid her to use. So, like I said before – I was absolutely impressed by the noodles. You can see in the video that I highlighted the noodle making. Do I usually put any pictures of the food in these videos? That would be a big Noski. 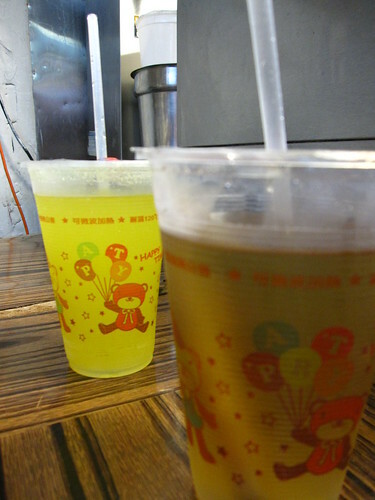 Seriously, now that they’re in Chinatown, you have no excuse not to come here. The IRL Arts Foundation and The Wandering Foodie thank Xian Famous Foods for providing this meal. Am I in the wrong town? Their attitudes are getting worse and worse. They don’t care about customers anymore. Their new job Jason said in person that he doesn’t care about losing one client like me. Honestly, I have been client of this store for a long time since his father start this store in Flushing. His father is humorous and gentle. But he is totally opposite. He will Ruin his father’s business one day or even sooner. Today, I only ask him to not add spice but sugar in the Tofu, which is very reasonable and simple. He refused. I said I have already ordered spicy dish here and don’t want to have another spicy one. He again refused. I as a customer, have been rejected by him twice. He even told me to buy it somewhere else and I don’t necessarily need to eat in their store. What a rude attitude. I am not a person who like arguments. I only feel as a customer for this store for a long time, my feelings have been hurt. I said I need to talk to his father. He said he will dial the number right away and he won’t answer any way. He also said I can sent email but it is him who responsible for the emails. What he want to say is ask me to get off, and he didn’t care about me as a client.Jason, you know, you will ruin your father’s business. Although you can speak English fluently, you are nothing and nothing compared to your father. Remember, it is your father who start this business very hard, and build a good relationship to other clients. You are rude to me today, and I believe you will be mad to other clients another day. You will see how you ruin the business day by day. I have to say, you are the worst boss I have ever seen. Jason, if you do care about your business. I need your apology publicly on your website. I know as one single customer. You even donâ€™t care about my complaints. But I do believe if you continue to be like this, more and more people will hate the way you run business, and wonâ€™t go to you store. You know, if you were not being rude to me this morning, I could bring other clients come. I was so disappointed how your father can let you be the boss. All those years sweats and tears. If your father see what you have done today, he will get disappointed too. You said I am ignorant and stupid. How could you look down upon others like this. Yes, I admit my English is not as fluent as you, but I do understand the meaning of words that you were cursing me. I will continue talk to all my friends not go to your store if you donâ€™t apologize to me. At first, I decided do nothing and let this go. Then I think instead of doing nothing and getting angry I will do something to criticize you. You are wrong? Jason? and you are a horrible boss. If I were you, I won’t go their store to eat. They will earn your money and disrespect you at all. The new boss Jason should be fired. He is not qualified to run the business. He is so rude to curse a client ignorant and stupid. How am I suppose to go back to eat? We as customer should protect our rights. We need to tell them that they didn’t do right, so that they will began to change. If you feel the same way as I do, please comments on Xi’an Famous Foods website or any related website or facebook to tell everyone you don’t like it, and tell other customers don’t go. Or they will suffer the same disappointment. It is us customers feed the restaurant, and give them and money and fame. but now, when their business are OK, they go back against us and became picky on clients. That IS NOT RIGHT. 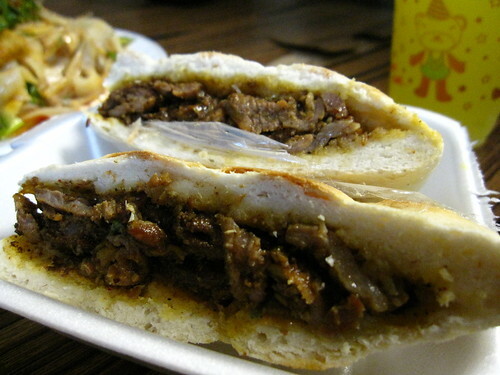 Hope Xi’an Famous Food can change their attitude and apologize to the public. I’m sorry I mistreated you the other day. Please accept my apology and come to my store on Bayard Street, I promise I’ll make it up to you. How about a free bowl of our special noodle? It’s not on our menu yet and inside you’ll find lamb intestine, testicle, stomach, and kidney. Yum Yum! I am writing to urge the public not to go to Xian Famous Foods on Bayard Street in Chinatown. The young owner there has a habit to pick fights with customers and to demand customers to leave his store. You do not usually hear stories that a business owner would kick customers out. The only exceptions are that the customer is a drunk, or a psycho, or is disturbing other customers. His food gets some good reviews and his ego gets shot up to the roof. However, it doesn’t give him the rights to insult and disrespect customers. After reading some reviews, I realized that I was not the only one mistreated by him. I wish the others can speak up and tell their stories. I’ve had great experiences every time I’ve been here.